The PEO was created on July 28, 1968 through the Executive Order formulated by the Sangguniang Panlalawigan (SP) of Misamis Oriental in support to the Republic Act 917 directing the local government, to establish a local government engineering office as part of a national DPWH decentralization program and as an engineering line agency whose main functions are to perform maintenance activities of“feeder” roads implemented by the DPWH.The funding for road maintenance projects were arranged to be 70% downloaded from the DPWH and 30% counterpart from the PLGU. Eventually, the PLGU developed a wider scope of responsibility in dealing with road maintenance activities. The decentralization of DPWH function results to the autonomy of the PLGU of Misamis Oriental in the determination and implementation ofroad and other infrastructure projects in the provincial level. Since the flagship contribution of the Marcos Administration was the construction of the national highways all over the Philippine archipelago, the maintenance and rehabilitation of roads was the primary program of the national government upon the establishment of the PEO. Along with time, the PEO advanced its capability and improved its services to deliver quality technical engineering services to its constituents. 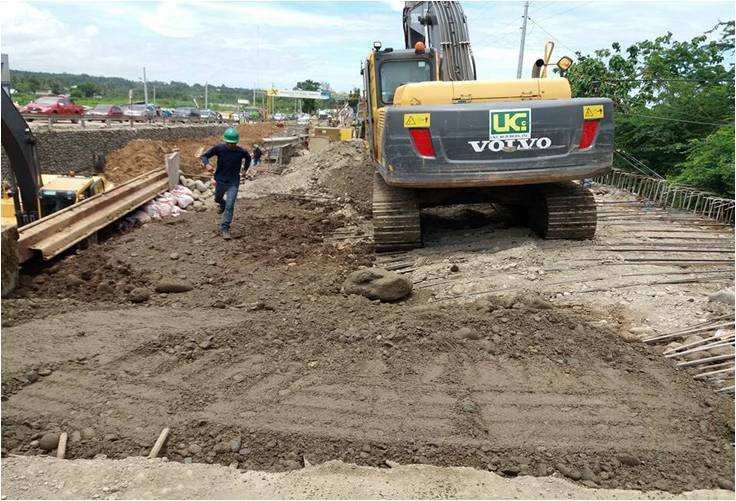 As a frontline agency belonging to infrastructure sector of the provincial bureaucracy, the office continued its search for excellence in providing technical engineering services consistent with the national standards of the DPWH in implementing infrastructures for horizontal and vertical projects. With the help of external assistance and other international development agencies such as the Australian Agency for International Development (AUSAID) through the Provincial Roads Management Facility (PRMF) whose entry point since 2010 was road managementand development based on rational and logical selection criteria, i.e., formulation of the Provincial Roads Network Development Plan(PRNDP),the PEO has evolved into a more competent, effective and efficient organization in terms of the following: (a) project planning and implementation, (b) monitoring of infrastructure projects; and, (c) assessment and evaluation to effect substantial economic and societal outcome. To date, the PEO has conducted around 90 various capacity development activities for engineers and other selected frontline administrative personnel. PRNDP which is a five-year road management and development plan utilizing scientific prioritization of provincial roads based on rational and logical selection criteria with respect to the LGU’s limited fund resource. Community and Stakeholder’s Consultation and community involvement in project implementation and sustaining the quality of road condition after the implementation are the fundamental features of the PRNDP. Road Maintenance Strategy (RMS) which is a maintenance strategy taking into account the kind of maintenance activity applicable to a distinct road condition. The strategy employs clustering of maintenance areas wherein Heavy Equipment Teams are distributed to three cluster areas to immediately address road maintenance concerns within their jurisdictions. The PEO is the planning, as well as, the implementing department of all engineering- related activities of the Provincial Government committed to improve the quality of living of its constituents by providing valuable service in the maintenance and concreting of provincial roads as well as the construction of various infrastructures leading to tourism sites/destinations of the province. The office is dedicated to provide quality technical service in the field of planning and designing of various infrastructures to all the municipalities and barangays in the province. customer service oriented organization that pursues the goal of infrastructure and poverty alleviation. while fulfilling their responsibility to protect the environment. 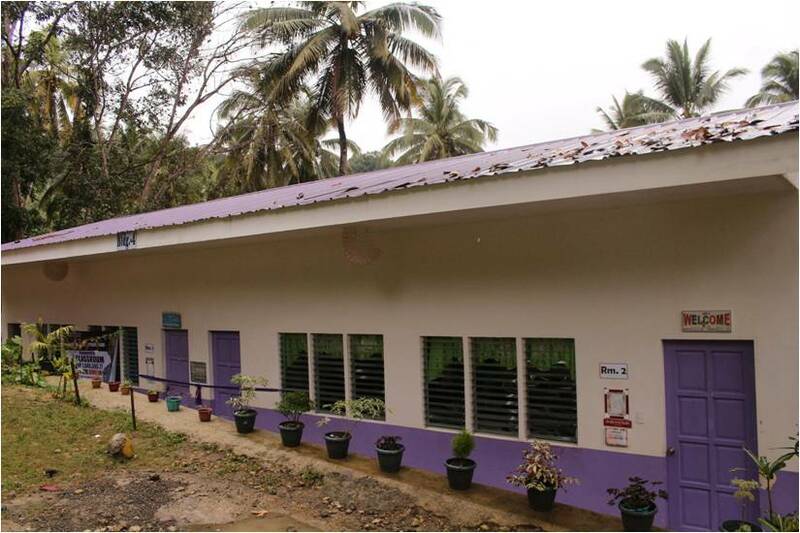 To provide infrastructure and equipment support services to socio-economic programs for poverty alleviation. 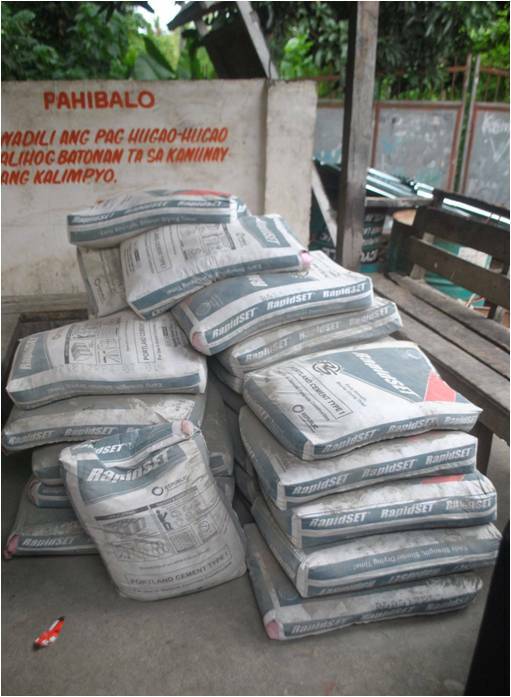 To provide quality engineering technical services to municipalities and barangays in the province. To manage professionally and efficiently all provincial infrastructure programs and project. To improve accessibility of public services and efficient all weather flow of agricultural and industrial commodities. To develop opportunities including in-house training, seminars and mentoring as part of a total program of individual skills growth for each employee. The current Provincial Government through the leadership of Governor YevgenyVincente B. Emano, issued a memorandum order 2015-017 and 2015-018, to create a team in addition to the present function a Barangay Infrastructure Team. The purpose of this team headed by Assistant Provincial Engineer Tessie B. Gales, is to ensure proper, effective and on time delivery of program and projects to respective barangay in the province. Basic services the team provide the validation through (qualifying and monitoring) the requested priority projects. In coordination to the Planning and Design division detailed estimates program of works and plans be prepared and approved by the Governor for implementation. Another services the team provide is the monitoring and inspection during the implementation of the project until its completion either by contract or by administration. 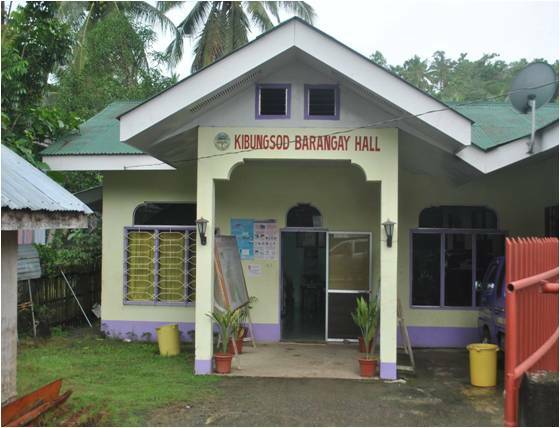 GOVERNOR’S OFFICE THROUGH OFFICE OF BARANGAY AFFAIRS RELEASED LIST OF PRIORITY PROJECTS AND FURNISHED COPY TO BARANGAY INFRASTRUCTURE PROJECTS TEAM/PEO. BARANGAY IFRASTRUCTURE TEAM WITH COORDINATION OF PEO PLANNING DIVISION CONDUCT VERIFICATION/EVALUATION OF THE PROPOSED PROJECT AT THE SITE. PEO PLANNING DIVISION PREPARE PLANS AND PROGRAM OF WORKS. PEO ADMIN. DIVISION PREPARE PURCHASE REQUEST, OBLIGATION REQUEST AND OTHER PERTINENT DOCUMENTS. CONCERN DEPARTMENTS WHERE FUNDING ORIGINATED FOR SIGNATURE. BUDGET DEPARTMENT FOR CONTROL AND SIGNATURE. ACCOUNTING FOR CONTROL AND SIGNATURE. TREASURER FOR CONROL AND SIGNATURE. RELEASE CHECK TO BARANGAY FOR IMPLEMENTATION BY ADMINISTRATION. 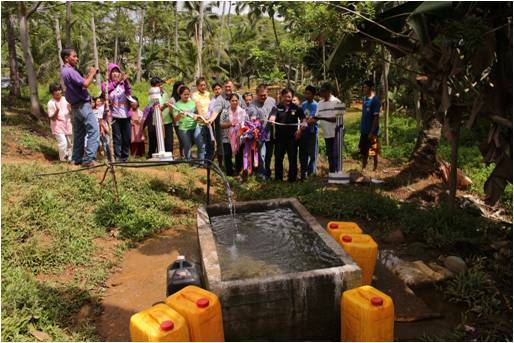 MONITORING AND EVALUATION OF THE IMPLEMENTED PROJECT BY BIP AND PEO PROJECT MONITORING TEAM. 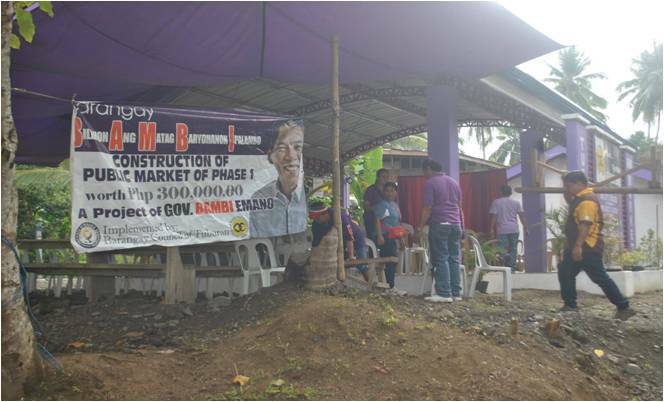 During the construction of public market of phase 1, at Brgy. Tubaran.